Get insight on your Automation jobs. Trigger an email or alert based on your runbook job status (for example, failed or suspended). Write advanced queries across your job streams. Correlate jobs across Automation accounts. Visualize your job history over time. The latest release of Azure PowerShell. A Log Analytics workspace. For more information, see Get started with Azure Monitor logs. The ResourceId for your Azure Automation account. If you have more than one Automation accounts, or workspaces, in the output of the preceding commands, find the Name you need to configure and copy the value for ResourceId. If you need to find the Name of your Automation account, in the Azure portal select your Automation account from the Automation account blade and select All settings. From the All settings blade, under Account Settings select Properties. In the Properties blade, you can note these values. On your computer, start Windows PowerShell from the Start screen. 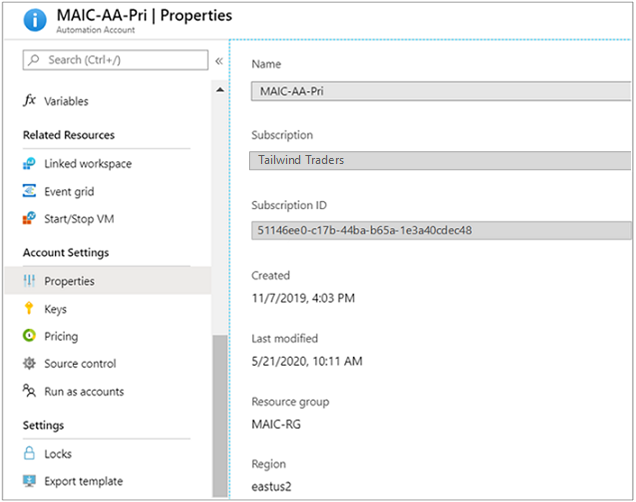 Run the following PowerShell, and edit the value for the [your resource id] and [resource id of the log analytics workspace] with the values from the preceding step. $workspaceId = "[resource id of the log analytics workspace]"
$automationAccountId = "[resource id of your automation account]"
After running this script, it may take an hour before you start to see records in Azure Monitor logs of new JobLogs or JobStreams being written. To see the logs, run the following query in log analytics log search: AzureDiagnostics | where ResourceProvider == "MICROSOFT.AUTOMATION"
Under Logs, the value for Enabled is True. The value of WorkspaceId is set to the ResourceId of your Log Analytics workspace. TimeGenerated Date and time when the runbook job executed. RunbookName_s The name of the runbook. Caller_s Who initiated the operation. Possible values are either an email address or system for scheduled jobs. JobId_g GUID that is the Id of the runbook job. Category Classification of the type of data. For Automation, the value is JobLogs. OperationName Specifies the type of operation performed in Azure. For Automation, the value is Job. CorrelationId GUID that is the Correlation Id of the runbook job. ResourceId Specifies the Azure Automation account resource id of the runbook. Category Classification of the type of data. For Automation, the value is JobStreams. ResultDescription Includes the output stream from the runbook. Now that you started sending your Automation job logs to Azure Monitor logs, let’s see what you can do with these logs inside Azure Monitor logs. To see the logs, run the following query: AzureDiagnostics | where ResourceProvider == "MICROSOFT.AUTOMATION"
One of the top customer asks is for the ability to send an email or a text when something goes wrong with a runbook job. To create an alert rule, you start by creating a log search for the runbook job records that should invoke the alert. Click the Alert button to create and configure the alert rule. From the Log Analytics workspace Overview page, click View logs. If you set up logs from more than one Automation account or subscription to your workspace, you can group your alerts by subscription and Automation account. Automation account name can be found in the Resource field in the search of JobLogs. To open the Create rule screen, click + New Alert Rule at the top of the page. For more information on the options to configure the alert, see Log alerts in Azure. In addition to alerting on failures, you can find when a runbook job has a non-terminating error. In these cases PowerShell produces an error stream, but the non-terminating errors don't cause your job to suspend or fail. In your Log Analytics workspace, click Logs. In the query field, type AzureDiagnostics | where ResourceProvider == "MICROSOFT.AUTOMATION" and Category == "JobStreams" and StreamType_s == "Error" | summarize AggregatedValue = count() by JobId_g and then click the Search button. Finally, you may want to visualize your job history over time. You can use this query to search for the status of your jobs over time. Setting up alerts to notify you when there is an issue. Azure Monitor logs provides greater operational visibility to your Automation jobs and can help address incidents quicker. To learn more about how to construct different search queries and review the Automation job logs with Azure Monitor logs, see Log searches in Azure Monitor logs. To understand how to create and retrieve output and error messages from runbooks, see Runbook output and messages. To learn more about runbook execution, how to monitor runbook jobs, and other technical details, see Track a runbook job. To learn more about Azure Monitor logs and data collection sources, see Collecting Azure storage data in Azure Monitor logs overview.